With the football season over BMGH takes a look at one of Burnley’s classic games: the 1983 League Cup semi final against Liverpool’s all conquering 1980s side featuring Kenny Dalglish, Ian Rush and Greame Souness. Burnley went into the game as huge underdogs taking on the English Champions from a position of 21st in Division Two and with only 2 wins in their previous 11 league games. However, the Clarets had knocked out Division One Tottenham in the previous round with a stunning 4-1 win at White Hart Lane, so could not be written off. 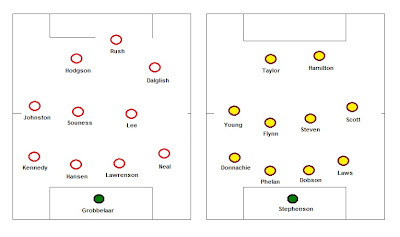 Both teams lined up in nominal 4-4-2 shapes but Dalglish was practically given a free role to roam from the right meaning Liverpool regularly looked more like a modern 4-3-3 with Johnston tucked in on the left and Dalglish very advanced almost as a striker. 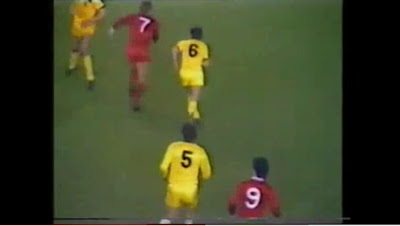 The movement and ability of Dalglish also had a knock on effect for Burnley’s shape as Brian Flynn tended to tightly pick up the Liverpool number 7 from central midfield whenever he drifted centrally, splitting the Clarets’ midfield, which often become 4-1-3-2 as a result (see below). The opening minutes saw Burnley struggle to retain possession and they were forced into defending deep with two tight banks of four hoping to deny the Champions space as they probed for an opening. 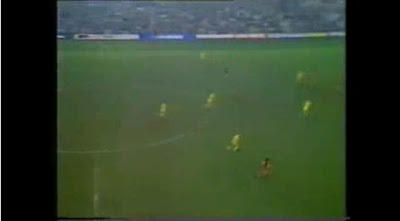 However, despite this solid shape and Flynn’s tracking of Dalglish, Burnley struggled to deal with Liverpool’s intelligent movement and confident fluid football and they managed to create a number of good chances early on in the game with Rush spurning one notable effort from a tight angle over the bar. Fortunately, the Clarets weathered the storm and grew into the game, mostly on the counter attack through long balls up to Hamilton and also through the impressive 19 year old Trevor Steven who became an increasingly effective outlet for Burnley in the middle with his direct running and incisive passing. Steven would go on to play 36 times for England and is regarded as the last great product of the Burnley ‘60s and ‘70s conveyor belt of talent and it’s easy to see why looking back at this game. With Burnley committing men forward however, spaces began to open up again for Liverpool, particularly between the lines as Burnley’s shape become stretched. 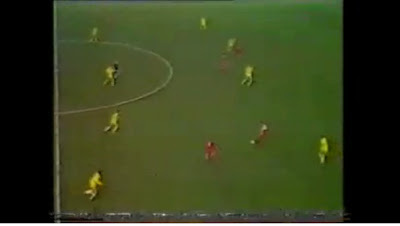 Below we see the start of a move where an opening is created for Dalglish as Hodgson drops off into ‘the hole’ and links up with Sammy Lee in midfield who plays in Dalglish behind the Burnley defensive line. As a modern football spectator (I was born in 1986, three years after this game), it’s easy to be impressed by Liverpool in this game. The willingness of the Liverpool defenders to play the ball short into midfield and the flexible movement of the forward players defies all the preconceptions about English football in the 1980s and it’s easy to see why they were so successful in European competitions. A modern day manager might have decided to play one, or possibly even two, holding midfielders in this zone to deny Dalglish and co space but Casper’s answer, as previously mentioned was to have Flynn man mark the Scottish International but it wasn’t particularly effective. In the picture below we see Flynn track Dalglish all the way to the space between his two centre backs Phelan and Dobson. 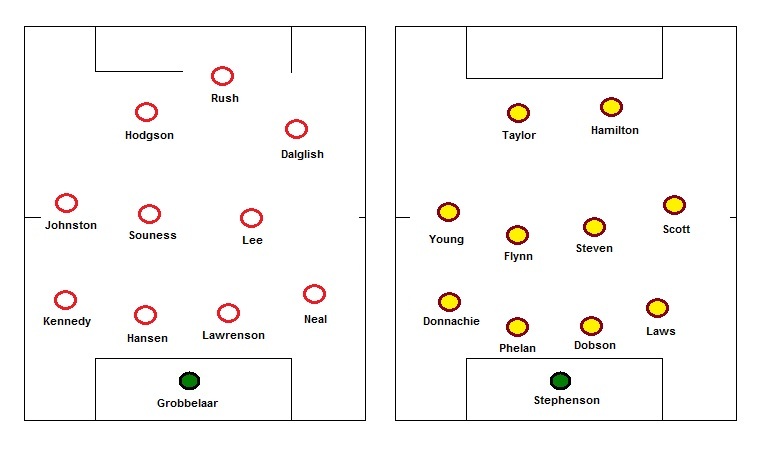 With Taylor and Hamilton staying high up the pitch this often left Steven 2 v 1 in the centre of the pitch against Souness and Lee which made it easy for Liverpool to keep possession (and all the more remarkable Steven’s influence on the game). After more Liverpool chances were missed by Hodgson and Rush, Burnley created their first real opening of the game as Steven lofted an exceptional long pass perfectly behind Kennedy to Scott who, one on one with Grobbelaar, could only hit his shot straight at the Zimbabwean stopper neglecting an easy square pass to Taylor who would have been left to slot the ball into an open goal. This signals Burnley’s best spell of the game and as half time approaches the Clarets begin to play some good football in the Liverpool half working a number of crossing opportunities on the left hand side before some crisp short interchanges through the middle led to another chance for Scott, who this time, hit into the side netting after rounding Grobbelaar. Burnley looked to be heading into half-time on top but football is a cruel sport and after a spot of pinball in the Clarets’ penalty area, the future Blackburn Rovers manager Greame Souness drove a deflected shot into the Burnley goal just before half time to make the score 1-0. It's hard to tell how this goal impacted on the respective dressing rooms at half-time but Liverpool started the second half strongly with Burnley penned into their own half, and in minutes another glaring Liverpool chance was wasted, this time by Dalglish after breaking through the Clarets’ back line but Burnley still looked a threat on the counter attack. A long ball down the left hand side gave Derek Scott a third chance, only to hit the ball wide after closing in on goal and another counter attack moments later ended in a dipping Steven shot from range hitting the bar but Burnley were quickly made to pay for missing these chances. Burnley looked to be getting back into the game but two closely followed penalty incidents tipped the game in favour of the Merseyside club. The first when Dalglish looked to have been pulled down by Flynn was turned down but the second was given after Ian Rush was brought down by a young Brian Laws after being played through. Liverpool’s number 2 Phil Neal stepped up and slotted away the penalty past Alan Stephenson to make it 2-0 to Liverpool with 15 minutes to go. Burnley pushed hard for an away goal as the seconds minutes ticked by but were quickly caught on the break again as Hodgson, released by Kenny Dalglish on the left hand side, rounded Stephenson and slotted the ball in the net making it 3-0 and effectively ending the tie. Liverpool had chances in the remaining minutes to extend their lead but couldn't take them meaning that the game ended 3-0. Burnley played incredibly well in this game and had Derek Scott taken one of his many chances, the result may have been slightly different. And although 26 years later Burnley would find themselves famously overcoming a three goal away deficit in a League Cup semi-final against Spurs (only to lose in extra time), on this occasion it proved too much despite Burnley winning the home leg at Turf Moor 1-0.